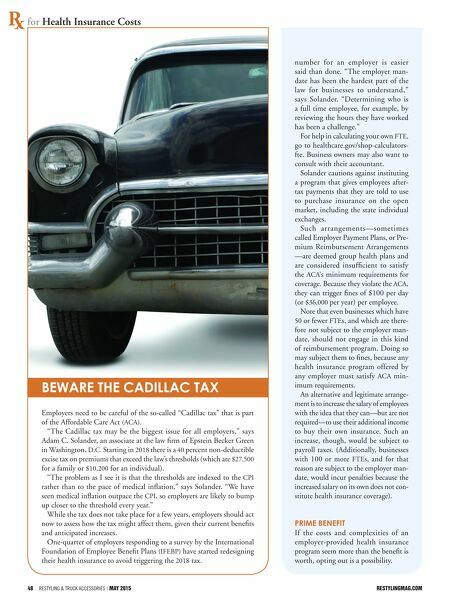 restylingmag.com May 2015 | Restyling & tRuck AccessoRies 49 "Some employers are attempting to stay below the 50 FTE threshold so they are not mandated to offer coverage," Stich says. In the IFEBP survey, one in 10 respon- dents said they had reduced hiring to stay below the threshold. Still others said they were reducing work hours so more employees fall into the part time worker category for which health insur- ance need not be offered. Despite those reports, the fact remains that most employers seem determined to continue offering what they deem a benefit, which is valued by employees and thus vital to business success. 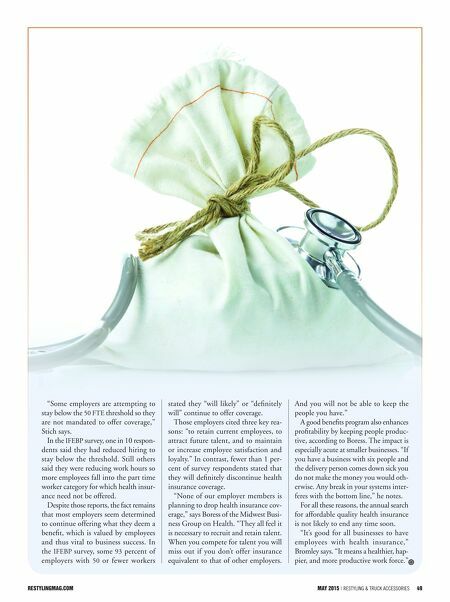 In the IFEBP survey, some 93 percent of employers with 50 or fewer workers stated they "will likely" or "definitely will" continue to offer coverage. Those employers cited three key rea- sons: "to retain current employees, to attract future talent, and to maintain or increase employee satisfaction and loyalty." In contrast, fewer than 1 per- cent of survey respondents stated that they will definitely discontinue health insurance coverage. "None of our employer members is planning to drop health insurance cov- erage," says Boress of the Midwest Busi- ness Group on Health. "They all feel it is necessary to recruit and retain talent. When you compete for talent you will miss out if you don't offer insurance equivalent to that of other employers. And you will not be able to keep the people you have." A good benefits program also enhances profitability by keeping people produc- tive, according to Boress. The impact is especially acute at smaller businesses. "If you have a business with six people and the delivery person comes down sick you do not make the money you would oth- erwise. Any break in your systems inter- feres with the bottom line," he notes. For all these reasons, the annual search for affordable quality health insurance is not likely to end any time soon. "It's good for all businesses to have employees with health insurance," Bromley says. "It means a healthier, hap- pier, and more productive work force."